TodoReloj's website aims at providing information about the company, its activities and the services provided to the general public. 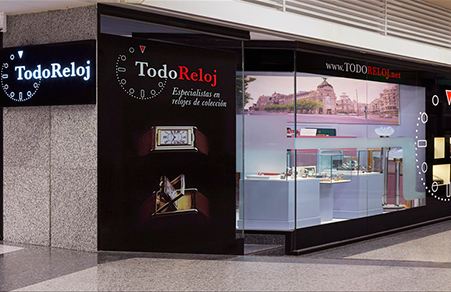 TodoReloj reserves the right to make, at any time and without notice, modify the information contained on its website. TodoReloj is not responsible for the consequences or damages arising from access to its website, the use made of the information contained in the website, or the access to other materials on the Internet made through their links. In compliance with the provisions of Law 34/2002 on "Servicios de la Sociedad de la Información y de Comercio Electrónico", we inform you that this website is owned by Nicolas Rodriguez Castaño SL. Our store is located at the Centro Comercial Moda Shopping - Local 44A Calle General Perón, 40. 28020 Madrid. For any questions or suggestions, please contact us by email tr-info@todoreloj.com or phone +34 91 556 94 19. All rights reserved. The intellectual property rights on the web, graphic design and codes are owned by TodoReloj. The intellectual property rights over the work contained in www.TodoReloj.com belong exclusively to TodoReloj except that a different ownership is indicated. The reproduction, distribution, commercialization or transformation of said work constitutes infringement of intellectual property rights of TodoReloj or the holder thereof, and may lead to the exercise of any judicial or extrajudicial actions they may be entitled in the exercise of their rights. - TodoReloj should be expressly cited as the source of information. - It is done with the intention of obtaining the information contained and not for commercial purposes or for use other than individual or private. - That no content included in this site are modified in any way. - That no element available on this site is used, copied or distributed separately from the text or other content that accompanies it. - That it is communicated in writing and in an irrefutable manner to TodoReloj and in turn, that a certified authorization from the company has been obtained for said reproduction. - That the reproduced elements will not be given to others or installed on a server connected to Internet or a local network. TodoReloj have no responsibility for the content of other websites that are not owned by it that may be accessed through a link from www.TodoReloj.com, as it have no the possibility to supervise the legality of the content thereof. TodoReloj rejects responsibility for the information contained in these websites. Any references that are made on the website of TodoReloj to any product, service, process, link, hypertext or any other information using the trademark, trade name or manufacturer or supplier, that are owned by others does not constitute or imply endorsement , sponsorship or recommendation by TodoReloj. TodoReloj no se hace responsable de los posibles errores de seguridad que se pudieran producir por el uso de versiones no actualizadas de navegadores, o de las consecuencias que puedan derivarse de un mal funcionamiento del navegador Además, TodoReloj no se hace responsable de la transmisión de cualquier virus o daños en el equipo que pueda surgir como resultado del acceso a este sitio web. TodoReloj rejects liability arising from the misuse of contents and reserves the right to update when it deems appropriate, eliminate, limit or prevent access to them, temporarily or permanently. The law applicable to these General Conditions will be the Spanish Law. Also, any disagreement between the two parties submit to the Courts of the city of Madrid with resignation to their own jurisdiction if different.